Part One— What Is Stress All About? 1. Part Two— What Does Stress Mean for Cops? 5. Part Three— Are There Ways We Can Tell It Is There? 9. Part Four— What Are Some of the Bad Effects of Stress on Cops? Part Five— How Does Stress Impact the Cop’s Family Life? Part Six— How Does the Worst of the Worst Affect Cops? Part Seven— What Is the Impact of Foreign Wars on Our Cops? 27. 28. Part Eight— What Are the Tools That a Cop Can Use to Better Handle Stress? 31. Part Nine— What Support Is Available for Cops? 35. Part Ten— How Can the Bosses Better Help Their Cops? 42. Herbert M. Gupton, Evan Axelrod, Luz Cornell, Stephen F. Curran, Carol J. Hood, Jennifer Kelly, and Jon Moss (2011) “Support and Sustain: Psychological Intervention for Law Enforcement Personnel,” The Police Chief, 78(8), 92–97. and often over time does, result in signs of traumatization as well as overt manifestations of post-traumatic stress disorder. Part Seven — What Is the Impact of Foreign Wars on Our Cops? America’s protracted wars in Afghanistan and Iraq have taken their toll on American law enforcement personnel serving in military reserve and National Guard units that have been activated for service. Police officers returning from a combat deployment and combat veterans seeking first-time employment as police officers both face the potential impact of psychological issues resulting from their combat experiences. Perhaps more frightening, recent research indicates an increased risk of suicide among returning combat veterans and among police officers. Additionally, law enforcement in the future will find itself dealing with wartime veterans as consumers of police services as those wartime experiences manifest themselves in homelessness, domestic violence, substance abuse, and violent behavior acted out “on the street.” Part Eight — What Are the Tools that a Cop Can Use to Better Handle Stress? looks at the methods by which individual officers may better handle the stress of their law enforcement world. These include increased stress management training, professional counseling for officers and their families, peer support, and required fitness standards and programs. Part Nine — What Support Is Available for Cops? examines some of the individual techniques and more successful programs recognized as providing effective police psychological services and support for officers under stress. Part Ten — How Can the Bosses Better Help Their Cops? 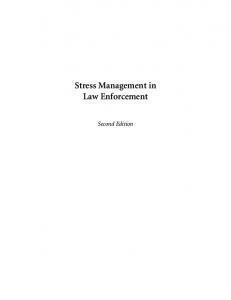 reflects on the role of the organization and agency managers in identifying, confronting, and reducing stress among an agency’s law enforcement personnel and includes recommendations by the Police Psychological Section of the International Association of Chiefs of Police for the psychological support of American law enforcement personnel. Acknowledgments We wish to express our thanks and indebtedness to the many distinguished scholars who allowed us to use the results of their hard earned labors. Without their dedicated efforts, this book would have never come to fruition. We also wish to thank the many publishers who allowed us to use the materials from their books and journals. However, we wish to give special thanks to a number of individuals who wrote research papers specifically for this book. These are: Dr. Laurence Miller, psychologist in private practice in Boca Raton, Florida; Dr. Michael Arter, Associate Professor, Pennsylvania State University at Altoona; Mr. Allen Kates, author and journalist; Ms. Karen Oehme, J.D., Director; Dr. Elizabeth A. Donnelly, and Mr. Zachary Summerlin, Institute for Family Violence Studies, Florida State University; Dr. John M. Violanti, Research Associate Professor, University of Buffalo, New York; Dr. Richard F. Cipriano, psychologist in private practice in Tampa, Florida; Dr. Carol Logan, Chief Psychologist, Austin, Texas, Police Department; and Ms. Teresa Tate, Founder, Survivors of Law Enforcement Suicide (SOLES). Typing and other numerous clerical services were also provided by our hardworking secretary Sharon Ostermann, whose constructive comments and long hours of work are very much appreciated. We also to wish to thank her assistant Shari Allen, whose dazzling speed on the computer keyboard helped to keep us on schedule. Lastly, we want to thank our publisher, Keith R. Sipe, for sharing our conviction that this book, like previous editions, will continue to make a significant contribution to the law enforcement profession. 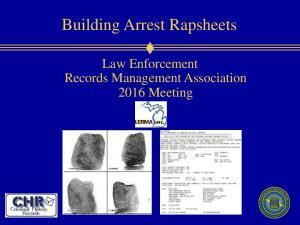 Report "Stress Management in Law Enforcement"